We’re looking for people to take a look at a brand new booklet on improving the well-being of young children with learning disabilities, and to give their feedback. 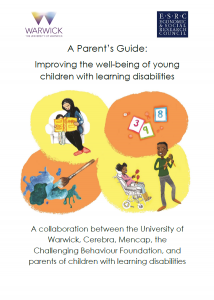 Researchers at the University of Warwick are working with a group of parents of children with learning disabilities, Mencap, the Challenging Behaviour Foundation, and Cerebra to write a guide for parents to support the well-being of young children with learning disabilities. The booklet combines what we know from research with parents’ personal experiences. The family activities within the booklet have been shown to be important for supporting the well-being of children with learning disabilities. You can download a copy of the booklet for free here. Please tell us what you think about it here. Is there By chance of borrowing a paper copy? Hi Emma, unfortunately we don’t have any printed copies as yet but if you drop me an email at [email protected] with your postal address, I’d be happy to print one out and post to you. could you send me a copy please I will email me my postal address. That’s great, we need as many people to review this as possible before it’s launched so thank you! I am Marie-Ora from I am an expert writer and language whiz and would like to write an article for cerebra.org.uk. I have some great topic ideas your readers will love! Who is the right person to speak to about this? Hi Marie-Ora, thanks for your comment. Drop [email protected] an email.